We hope you’re hungry, because San Mateo County is packed to the brim with restaurants specializing in just about every type of cuisine, local and exotic. From craft brewhouses to northern Italian eateries, meals always seem better when enjoyed outdoors. 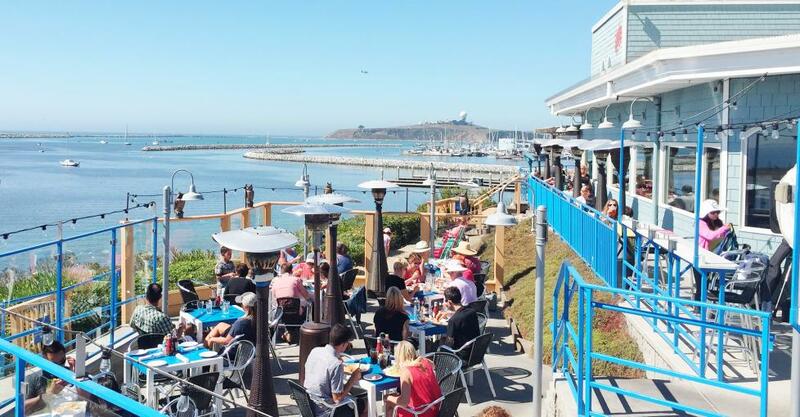 Whether you’re exploring Half Moon Bay or Redwood City, here are eight of our best restaurants with outdoor seating. While in North County, head to WhiteCaps Drinks + Eats in Brisbane. Catch a bay breeze on the heated patio when you “come for the drinks, stay for the eats”. And with eight local beers on tap and a seasonal, globally inspired menu, you will do just that. Many of their dishes use herbs from the onsite garden and honey from their roof top beehive. The menu changes weekly as ingredients go in and out of season, so you’ll want to indulge and order whatever catches your eye – it may not be available next time! For a taste of northern Italian cuisine, head to Stella Alpina Osteria in Burlingame. With its intimate, heated patio, this neighborhood osteria serves up classic plates as well as a few chef specials. As with cuisine typical of the Alps in northern Italy, many dishes incorporate juicy braised meats, pastas, ragus and risottos. The housemade potato gnocchi and veal osso buco over mascarpone polenta are local favorites. Families will enjoy the burgers and shakes at Jack’s Prime, as will anyone else with a hearty appetite. The outdoor dining area is casual, covered and kid-friendly. The modern-day San Mateo diner is a go-to spot to enjoy flame-grilled burgers and hand-spun shakes, as well as beer, wine and other Californian cuisine staples. Of course, there are plenty of vegetarian dishes as well. Local ingredients are used whenever possible, and for burgers, natural Niman Ranch beef. Craving some fresh seafood? Head straight to The Fish Market in Palo Alto and dine outside among the beautiful flowers. Ever since opening its doors in 1976, it’s been a favorite among locals. Specializing in fresh fish, this hotspot features an oyster bar, cocktail lounge and retail market. The front porch is the perfect place to perch with a plate of the freshest raw oysters and clam strips. Saint Michael’s Alley is another Palo Alto hotspot. Described as a “bohemian beatnik cafe,” the restaurant is a nice place to go for lunch or even a romantic dinner for two. The space actually started as a small coffeehouse, but has since expanded into a full-blown dining establishment. On a warm evening, the outdoor patio offers a relaxing yet polished experience. Try the spring vegetable risotto or the red snapper. If you’re heading to Redwood City for dinner and entertainment, Angelica’s offers both. The space includes a beer garden, a side patio, restaurant and bar, and hosts live entertainment nightly, from jazz bands to Flamenco. Decor speaks to a 1930s theme, with sparkling chandeliers in the dining room and commissioned paintings throughout. As for the food, try the prime rib or lamb shank and splurge on the salted caramel cake for dessert. After a full day of exploring our area, you’ve earned yourself an ice-cold beer at Half Moon Bay Brewing Company. Swing by for a cold brew or a bite to eat and enjoy the view of the Pacific from the outdoor patio. The relaxed brewpub crafts its own beer in the in-house brewery, and uses the finest ingredients available. Some brews are offered year-round, while others are seasonal. Come on the weekend and get ready for live music. Also in Half Moon Bay is Sam’s Chowder House, a New England–style seafood house with a patio dining area that overlooks the Pacific Ocean. It’s especially well known for its clam chowder and lobster rolls, so don’t leave without ordering one (or both)! Sunset views are pretty spectacular from the patio, so try to plan for a late-afternoon or early-evening meal. See all that San Mateo County/Silicon Valley has to offer! Order a visitor guide today and start planning your trip! Award-winning writer and top-ranked travel blogger. Digital strategist and social media consultant.